1Not all sales at MSRP 2Not available with lease and some other offers. See dealer for details. 3Not available with special financing, lease and some other offers. See participating dealer for details. 4Must qualify through GM Financial. Not available with special finance, lease, or some other offers. Take delivery by 04-30-2019. See dealer for details. Finance for $431 per month at 3.99% APR for 72 months with $3,610 down payment. Payment expires on 04/30/19. Estimated Finance payment based upon 3.99% APR for 72 months, with a down payment of $3,610. Excludes title, taxes, registration, and license fees. Some customers will not qualify. See your authorized dealer for complete details on this and other offers. Residency restrictions may apply. Lease for $222/month for 39 months with $3,610 due at signing including $0 Security Deposit and 10,000 miles per year. Payment expires on 04/30/19. Estimated Lease payment based on 39 months and $3,610 due at lease signing. Cash due at signing includes $3,488 capitalization cost reduction, which includes $650 acquisition fee, plus a required security deposit of $0, and first month's lease payment of $222. Excludes title, taxes, registration, and license fees. Total monthly payments equal $12,778. Mileage charge of $0.25 per mile over 10,000 miles. Not all consumers will qualify. Residency restrictions may apply. 1Not all sales at MSRP 2Not available with special financing, lease and some other offers. See participating dealer for details. 3Must qualify through GM Financial. Not available with special finance, lease, or some other offers. Take delivery by 04-30-2019. See dealer for details. Finance for $498 per month at 3.99% APR for 72 months with $4,081 down payment. Payment expires on 04/30/19. Estimated Finance payment based upon 3.99% APR for 72 months, with a down payment of $4,081. Excludes title, taxes, registration, and license fees. Some customers will not qualify. See your authorized dealer for complete details on this and other offers. Residency restrictions may apply. Lease for $291/month for 39 months with $4,081 due at signing including $0 Security Deposit and 10,000 miles per year. Payment expires on 04/30/19. Estimated Lease payment based on 39 months and $4,081 due at lease signing. Cash due at signing includes $3,141 capitalization cost reduction, which includes $650 acquisition fee, plus a required security deposit of $0, and first month's lease payment of $291. Excludes title, taxes, registration, and license fees. Total monthly payments equal $15,115. Mileage charge of $0.25 per mile over 10,000 miles. Not all consumers will qualify. Residency restrictions may apply. Finance for $505 per month at 3.99% APR for 72 months with $4,131 down payment. Payment expires on 04/30/19. Estimated Finance payment based upon 3.99% APR for 72 months, with a down payment of $4,131. Excludes title, taxes, registration, and license fees. Some customers will not qualify. See your authorized dealer for complete details on this and other offers. Residency restrictions may apply. Lease for $296/month for 39 months with $4,131 due at signing including $0 Security Deposit and 10,000 miles per year. Payment expires on 04/30/19. Estimated Lease payment based on 39 months and $4,131 due at lease signing. Cash due at signing includes $3,186 capitalization cost reduction, which includes $650 acquisition fee, plus a required security deposit of $0, and first month's lease payment of $296. Excludes title, taxes, registration, and license fees. Total monthly payments equal $15,355. Mileage charge of $0.25 per mile over 10,000 miles. Not all consumers will qualify. Residency restrictions may apply. Finance for $496 per month at 3.99% APR for 72 months with $4,071 down payment. Payment expires on 04/30/19. Estimated Finance payment based upon 3.99% APR for 72 months, with a down payment of $4,071. Excludes title, taxes, registration, and license fees. Some customers will not qualify. See your authorized dealer for complete details on this and other offers. Residency restrictions may apply. Lease for $290/month for 39 months with $4,071 due at signing including $0 Security Deposit and 10,000 miles per year. Payment expires on 04/30/19. Estimated Lease payment based on 39 months and $4,071 due at lease signing. Cash due at signing includes $3,132 capitalization cost reduction, which includes $650 acquisition fee, plus a required security deposit of $0, and first month's lease payment of $290. Excludes title, taxes, registration, and license fees. Total monthly payments equal $15,066. Mileage charge of $0.25 per mile over 10,000 miles. Not all consumers will qualify. Residency restrictions may apply. Finance for $516 per month at 3.99% APR for 72 months with $4,211 down payment. Payment expires on 04/30/19. Estimated Finance payment based upon 3.99% APR for 72 months, with a down payment of $4,211. Excludes title, taxes, registration, and license fees. Some customers will not qualify. See your authorized dealer for complete details on this and other offers. Residency restrictions may apply. Lease for $304/month for 39 months with $4,211 due at signing including $0 Security Deposit and 10,000 miles per year. Payment expires on 04/30/19. Estimated Lease payment based on 39 months and $4,211 due at lease signing. Cash due at signing includes $3,258 capitalization cost reduction, which includes $650 acquisition fee, plus a required security deposit of $0, and first month's lease payment of $304. Excludes title, taxes, registration, and license fees. Total monthly payments equal $15,742. Mileage charge of $0.25 per mile over 10,000 miles. Not all consumers will qualify. Residency restrictions may apply. Finance for $523 per month at 3.99% APR for 72 months with $4,260 down payment. Payment expires on 04/30/19. Estimated Finance payment based upon 3.99% APR for 72 months, with a down payment of $4,260. Excludes title, taxes, registration, and license fees. Some customers will not qualify. See your authorized dealer for complete details on this and other offers. Residency restrictions may apply. Lease for $309/month for 39 months with $4,260 due at signing including $0 Security Deposit and 10,000 miles per year. Payment expires on 04/30/19. Estimated Lease payment based on 39 months and $4,260 due at lease signing. Cash due at signing includes $3,302 capitalization cost reduction, which includes $650 acquisition fee, plus a required security deposit of $0, and first month's lease payment of $309. Excludes title, taxes, registration, and license fees. Total monthly payments equal $15,982. Mileage charge of $0.25 per mile over 10,000 miles. Not all consumers will qualify. Residency restrictions may apply. Finance for $530 per month at 3.99% APR for 72 months with $4,311 down payment. Payment expires on 04/30/19. Estimated Finance payment based upon 3.99% APR for 72 months, with a down payment of $4,311. Excludes title, taxes, registration, and license fees. Some customers will not qualify. See your authorized dealer for complete details on this and other offers. Residency restrictions may apply. Lease for $310/month for 39 months with $4,311 due at signing including $0 Security Deposit and 10,000 miles per year. Payment expires on 04/30/19. Estimated Lease payment based on 39 months and $4,311 due at lease signing. Cash due at signing includes $3,352 capitalization cost reduction, which includes $650 acquisition fee, plus a required security deposit of $0, and first month's lease payment of $310. Excludes title, taxes, registration, and license fees. Total monthly payments equal $16,085. Mileage charge of $0.25 per mile over 10,000 miles. Not all consumers will qualify. Residency restrictions may apply. Finance for $550 per month at 3.99% APR for 72 months with $4,451 down payment. Payment expires on 04/30/19. Estimated Finance payment based upon 3.99% APR for 72 months, with a down payment of $4,451. Excludes title, taxes, registration, and license fees. Some customers will not qualify. See your authorized dealer for complete details on this and other offers. Residency restrictions may apply. Lease for $324/month for 39 months with $4,451 due at signing including $0 Security Deposit and 10,000 miles per year. Payment expires on 04/30/19. Estimated Lease payment based on 39 months and $4,451 due at lease signing. Cash due at signing includes $3,477 capitalization cost reduction, which includes $650 acquisition fee, plus a required security deposit of $0, and first month's lease payment of $324. Excludes title, taxes, registration, and license fees. Total monthly payments equal $16,756. Mileage charge of $0.25 per mile over 10,000 miles. Not all consumers will qualify. Residency restrictions may apply. The Chevrolet Silverado 1500 is bold, strong, and expertly designed to work hard like a truck, but with all the modern conveniences you should expect in 2018. Our Killeen, TX Chevy dealership has a huge inventory of Silverado 1500s ready for you to test drive. You'll love the powerful engine options, paired with amazing fuel economy not found in most full-size pickup trucks. No matter what you're towing or where you're driving, the Chevy Silverado is quiet and comfortable. Never has a truck been so strong, durable, and comfortable. 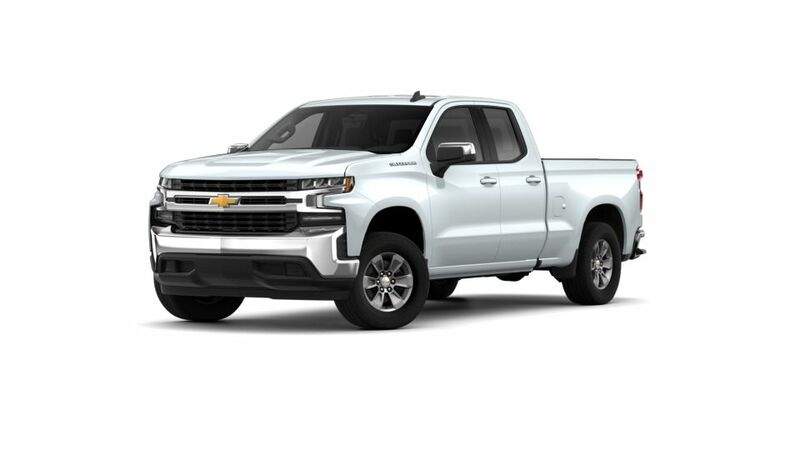 Visit our model showroom, take a look online at our current Chevy Silverado 1500 inventory, or stop by our Fort Hood area Silverado dealership for a test drive today! Why is the such a popular choice for Killeen drivers? • The is a timeless American pickup. It is a well-liked truck with a comfortable ride and low-noise interior, and it can transport your heavy loads. • The starting engine is a 285-hp V-6, but if you need increased strength, you can opt for a 355-hp V-8 or a 420-hp V-8, offering you the most horsepower available in its class. • It is sold with several trims and engines, with max payload of 2,260 lbs. and maximum towing of up to 12,500 lbs., and all-wheel drive is optional on all models. • Technology lovers can take advantage of this truck’s available onboard 4G LTE Wi-Fi and cordless charging with a built-in charging pad in the center armrest. Look through our inventory of new s in Killeen to choose the color and trim level that that will get the job done for you. For more info, contact us at 254-247-3557 about buying or leasing a .